Growing government initiatives, increasing construction market, rising demand for next-generation electronic security and lighting control systems are some of the key factors that have resulted in the overall growth of building automation and control market in India. Building automation systems registered maximum installation across areas such as commercial offices, shopping centers, residential, hotels and hospitals in 2016. According to 6Wresearch, India building automation & control systems market size is expected to grow at a CAGR of over 12.5% during 2017-23. In India, safety & security systems contributes for the maximum revenue followed by HVAC systems and is expected to maintain its dominance in the market during the forecast period due to huge amount of installation in the government & transportation, hospitality and other verticals. In the safety & security segment, the fire & safety equipment led the market due to government regulation for mandatory installation of fire and safety systems in the commercial buildings, offices, metros and airports. The Government & transportation vertical acquired majority of the India building automation & control systems market share in 2016 due to installation of fire safety and surveillance systems. 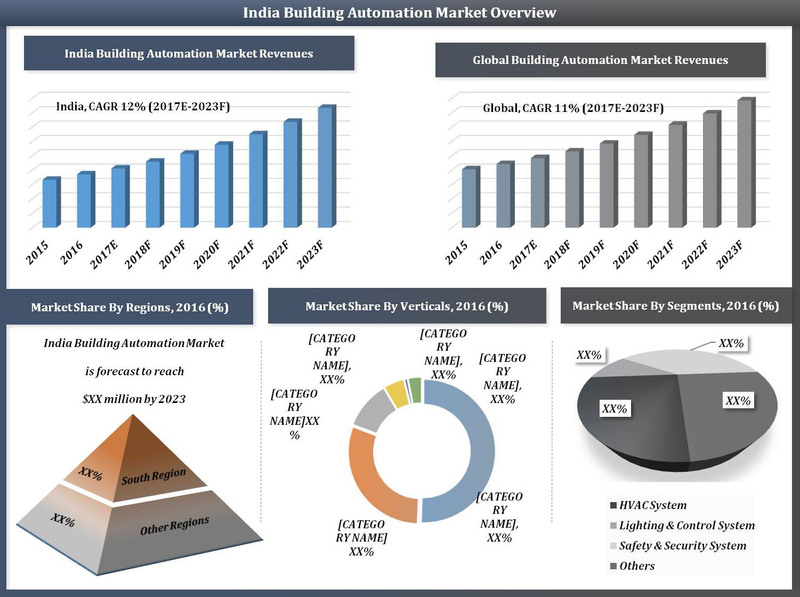 The India building automation & control systems market report thoroughly covers the market by Building Automation System types, verticals and regions. The India building automation & control systems market outlook report provides an unbiased and detailed analysis of the India building automation & control systems market trends, opportunities/high growth areas, market drivers which would help the stakeholders to device and align their market strategies according to the current and future market dynamics. 14.6 Rockwell Automation India Pvt. Ltd.